The family Gobidae arguably got a big update in the past month, with a deluge of diminutive new goby species for fans of nano fishes. 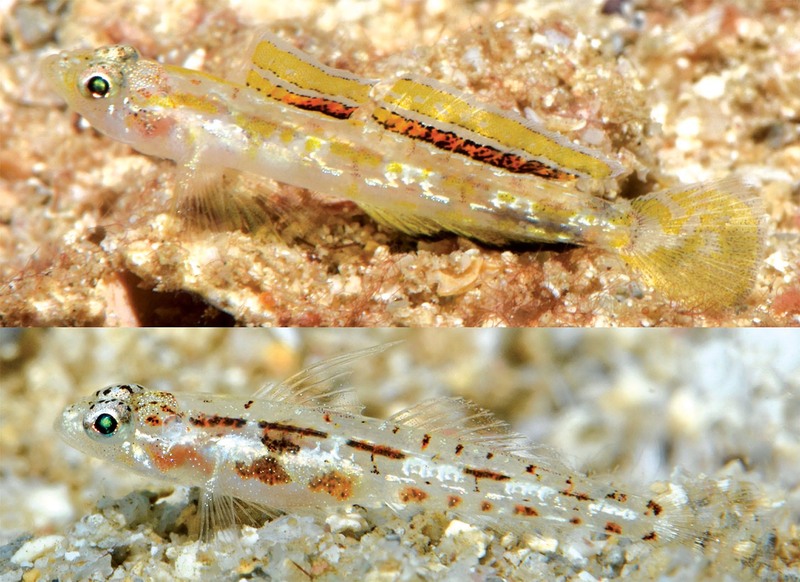 Ten new species of freshwater and marine gobies, all hailing from the tropical Western Pacific region, were recently described in three separate papers. All of these species descriptions are freely available for download and review. In the journal Cybium, authors Philippe Keith, Clara Lord, Hadi DarHuddin, Gino Limmon, Tedjo Sukmono, Renny Hadiaty, and Nicolas Hubert share the article Schismatogobius (Gobiidae) from Indonesia, with descriptions of four new species. The four new species of freshwater gobies include Schismatogobius saurii, Schismatogobius bussoni, Schismatogobius risdawatiae, and Schismatogobius arscuttoli. 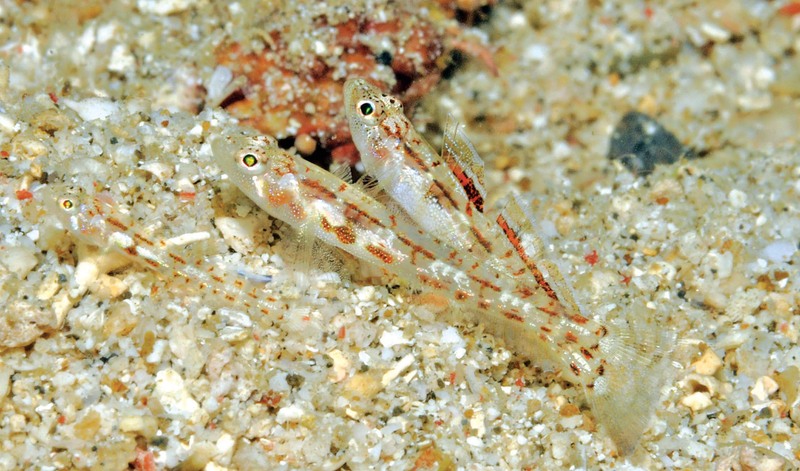 These are small freshwater gobies, generally in the vicinity of 1″ (25.4 mm) in length. Three of the species can be found in Sumatra; S. saurii can also be found in Java, Bali, Lombok, Ambon, and Panay, while S. bussoni is known only in Seram (formerly Ceram) and Ambon Islands (part of Indonesia’s Maluku Islands). All of these species were “collected in freshwater streams with moderate to fast flow in shallow areas of gravel,” with most reported at low elevations, some just above the area of “tidal influence.” These species’ general proximity to saltwater is noteworthy, as some coastal freshwater gobies are known to have a marine larval phase before returning to freshwater later in life. Three of the new species are reported as sexually dimorphic and sexually dichromatic; only females were observed for S. arscuttoli, leaving us to wonder what the male of the species looks like. 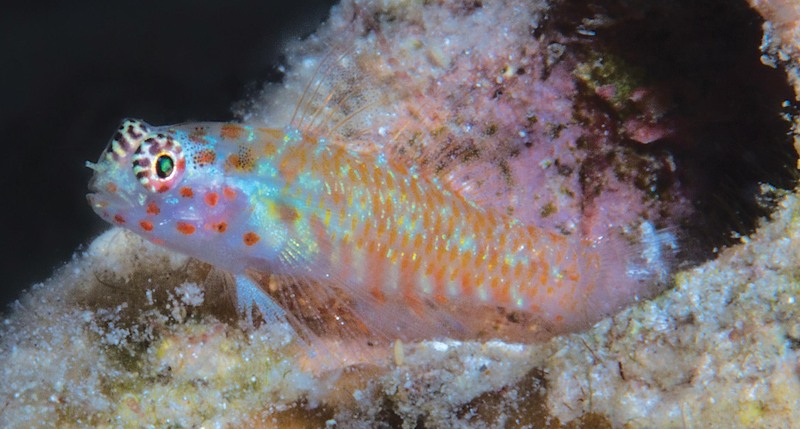 Publishing in the Journal of the Ocean Science Foundation, authors David W. Greenfield and Mark V. Erdmann bring us Eviota pictifacies, a new dwarf goby from Sumbawa, Indonesia (Teleostei: Gobiidae). A quick check-in with Fishbase currently shows their running list of valid Eviota species containing 108, while the authors place that number higher, at 112. E. pictifascies brings the total to at least 113, with potentially more new species descriptions to come. The etymology of the species epithet pictifacies suggests that the “Painted-Face Dwarf Goby” may be a good common name for the species. Initially discovered during Whale Shark surveys, Eviota pictifacies is another tiny goby species, with the holotype and paratypes measuring only from 13.4 mm to 17.00 mm standard length (approximately 0.5 to 0.66″). Interestingly, if you could actually get one to sit upside down underneath a microscope for long enough, you’d discover that there is some sexual dimorphism in this species of Eviota. The authors report that the “urogenital papilla of male [has] straight smooth sides with many small papilla on end, [while the] female urogenital papilla [is] smooth and bulbous, with short finger-like projections on end.” While probably difficult to discern in live specimens, this is perhaps useful information for sexing other Eviota spp. 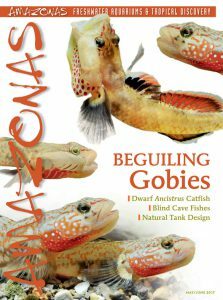 gobies as well, should you ever be bold enough to try to breed them and inventive enough to find a way to put this information into practice. Adult males of three new species of Grallenia: A) G. compta; B) G. dimorpha; C) G. rubrilineata. Image credits: Gerald R. Allen & Mark V. Erdmann. 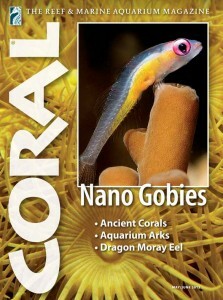 Gerald Allen and Mark Erdmann bring us five new marine goby species in the Journal of the Ocean Science Foundation. 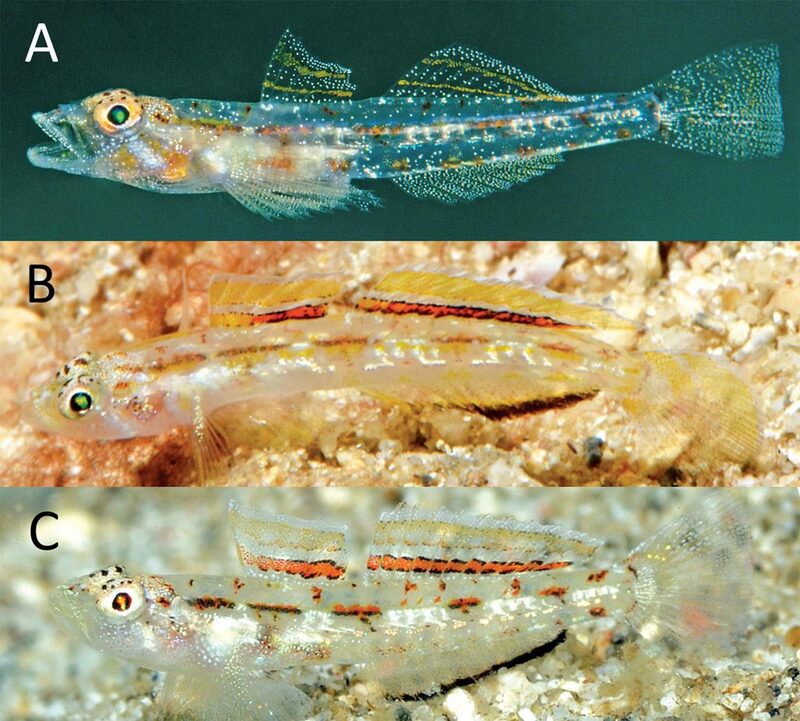 The paper, Description of five new species of marine gobies (Teleostei: Gobiidae) of the genus Grallenia from the tropical western Pacific Ocean, introduces several small, cryptic, yet often gorgeously-colored, sexually-dimorphic species of sand-dwelling gobies. The new species include the Ornamented Goby (Grallenia compta), the Dimorphic Goby (Grallenia dimorpha), the Lau Goby (Grallenia lauensis), the Redstripe Goby (Grallenia rubrilineata), and the Solomons Goby (Grallenia solomonensis). Once again, we’re looking at extremely small fish; across the five new species, the largest specimen recorded was a 17.3-mm (0.68-in) specimen of G. compta. Male coloration is known for three of the five new species (G. compta, G. dimorpha, G. rubrilineata), as these males are more attractively sexually-dichromatic. G. dimorpha also exhibits exaggerated and pronounced sexual dimorphism in the first dorsal fin. The paper also includes a useful diagnostic key for differentiating all of the species contained in the genus Grallenia. The paper closes by noting that some of the specimens associated with the type species of the genus (G. arenicola) may in fact belong to yet another undescribed species, so expect more news to come.